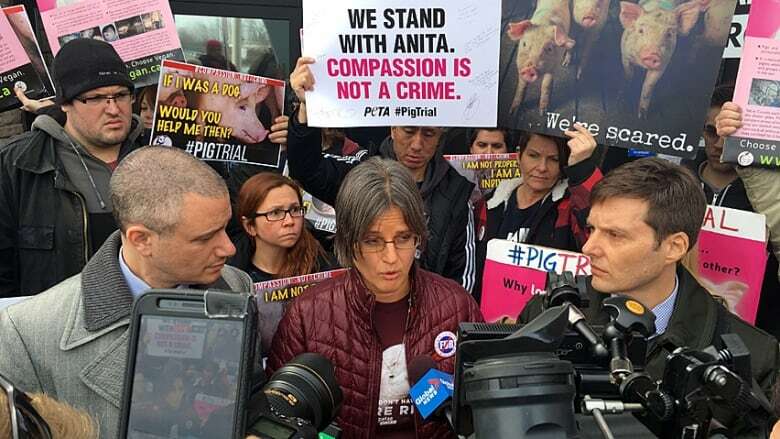 A judge ruled Thursday that animal rights activist Anita Krajnc, who gave water to pigs outside a slaughterhouse, was not guilty of mischief. 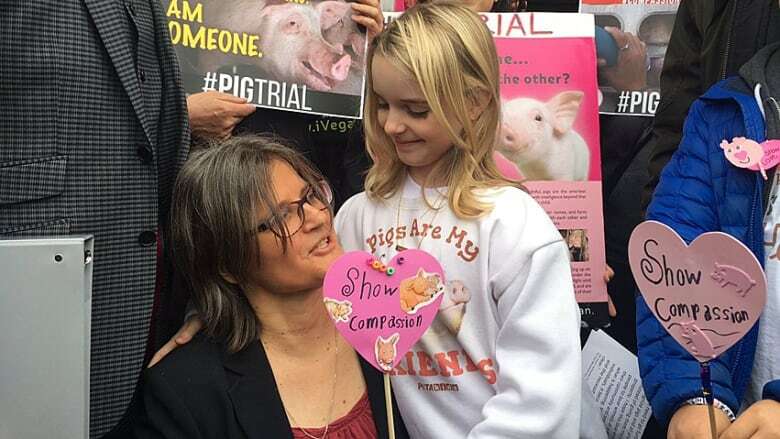 Judge David Harris dismissed a charge Thursday against Krajnc, the 49-year-old founder of Toronto Pig Save. Krajnc was charged after she poured water into the openings of a metal trailer outside Fearman's Pork Inc. in Burlington, Ont., in June 2015. The trial began last year and included five days of testimony. If convicted, Krajnc could have been fined and sent to jail for six months. It was clear Krajnc was giving the pigs water, Harris said, and not an "unknown liquid" as police initially alleged. And the pigs were slaughtered anyway, which means she didn't obstruct their "lawful use." Harris rejected the assertion by Krajnc's vegan lawyers, James Silver and Gary Grill, that pigs are persons and not property. He also had stern words for the lawyers comparing Krajnc to Gandhi, Nelson Mandela and Susan B. Anthony, a comparison that seemed designed to generate headlines for her cause and "look good in the social media posts." He was also annoyed that Krajnc's lawyers compared her giving water to pigs to Hungarians giving water to Jews headed to concentration camps. "I found the comparison to be offensive," Harris said, "and I will be attaching no weight to it in my decision." Krajnc didn't ask to be charged, Silver said outside the Milton, Ont., courthouse afterward. But since she was, she had the right to present her argument. "The Crown decided that this was a case that they wished to pursue," he said. "At the very outset, the Crown always had the opportunity to stop the process. In fact, it took weeks before Anita was charged in the very first place. They never had to start the process." "A lot of taxpayer money was wasted on this case," Grill said. Overall, Silver called the dismissal a victory. Harris's decision shows "compassion is not a crime," he said. Farm groups, meanwhile, called it a "disappointing day." They maintain that Krajnc was messing with the food supply. "What was at stake was our family farms and producing safe quality food," said Clarence Nywening, president of the Christian Farmers Federation of Ontario. "This puts a big jeopardy on our livelihood now." Bruce Kelly, program manager with Farm and Food Care Ontario, didn't see it as a precedent. "This was one day and one court and one incident on one sidewalk in Burlington." ​Krajnc's case has attracted intense international interest. It has inspired 150 other Pig Save groups, and celebrities such as Maggie Q and Moby have lent support. Mckenna Grace, the 10-year-old star of the movie Gifted, attended Thursday. This isn't the end of Krajnc's legal woes. She's charged with obstructing police after a truck rollover near Fearman's in October. Her next appearance on that charge is May 17 in Milton court.